I haven’t always been tall. I guess it started around 8th grade; I shot up, got all reedy. Part of me thought it wouldn't stick. But I'm tall now—5 feet 11.5 inches, if you want exact specs. Any shoes whatsoever push me over the six–foot threshold. I’m the worst at concerts. When I stand next to my short friends, they joke that I look like their mother. To be a girl who’s six feet tall is to be conspicuous. To be a girl who is six feet tall is to round down with the hope of blending in, to watch the expression on a new acquaintance’s face contort when you stand up for the first time, to be met with stares in public, to memorize and predict the intrusive questions. No, I don’t play basketball. Sure, the weather up here is fine. And—not that you asked—I can sometimes see your dandruff from this angle. I’m an anxious person, and sometimes I worry that just by existing at this altitude, I’m making people uncomfortable. That somehow I’m subverting gender dynamics or calling attention to our prescriptive notions of femininity by being too visible, too conspicuous. But I had a realization recently. I’m just tall. There’s no meaning to it and there’s no changing it, no matter how much coffee I chug to retroactively stunt my growth. It’s a fact of life, no more mutable than the whirr of garbage trucks outside my window on Wednesday mornings. And I just have to deal. So that’s what this letter is about. Acceptance. At Street, there are constantly moving pieces, and it can be hard to feel like you’re keeping a lid on everything. And at Penn, the want of perfection can get so attractive and unattainable that it precludes you from doing anything other than checking Instagram stories while you pee. It’s easy to think of acceptance as passivity, that accepting things means letting them wash over you. But I’m trying to think of it with a critical eye. There’s a moderation to well–practiced acceptance, one I haven’t quite hit on yet. You straddle the line between existing in the world and trying to change it. But I think for now it’s important to try to understand it. So you try to take it in. To take culture, art, politics, change—all those things swirling around us—and synthesize, analyze, understand, critique, think. 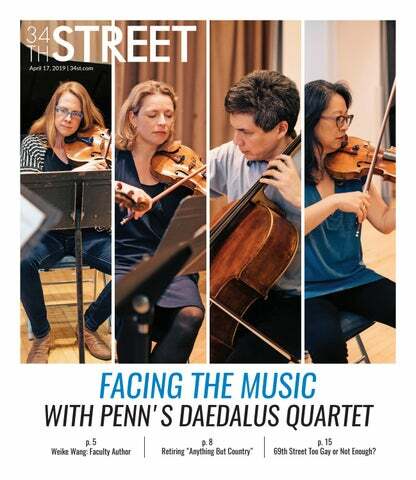 And I hope that’s what Street’s first issue of 2019 does. Hope you enjoy it. And if not, just accept it.